7 in. x 20 in. Tuscany Ivory..
7 in. x 20 in. 3D Ivory Hone..
Ivory travertine has the highest order of shade but it is comparatively less filled than classic tiles. You should be able to use ivory travertine in your bathroom, kitchen, dining space etc. 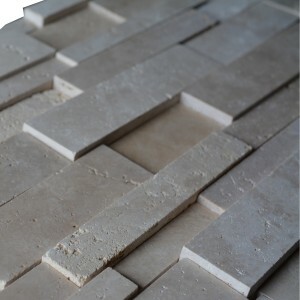 The ivory travertine has neutral tone and makes it very suitable for homemaking purposes. It functions great when it has a square shape and contemporary shapes. 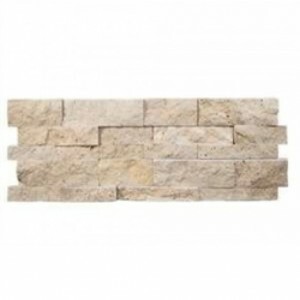 Travertine tiles is not only affordable for the common folks but it also is popular among the people who generally prefer expensive travertines. Generally Ivory travertine has a large variety of collection and patterns. It is very useful for flooring purposes because of it’s unique veining. It never ceases to amaze the user about the great possibilities that can be brought by using Ivory travertine. Here at marblenthings we have cream or what some might call Ivory color with brick pattern. The finish given is splitface. Homemaking is an art and it makes sense to use the best resources available like Ivory travertine to furnish your home with grace and beauty. Finding your perfect tiles is not so hard anymore because we are here to assist you. Feel free to contact us for any emerging queries.